Do you know this duck? If so, the Belfast Police Department would like to hear from you. Police apprehended the duck waddling through downtown Belfast on Monday afternoon and believe it is a pet on the lam. BELFAST, Maine — The Bangor Police Department may have its Duck of Justice, a famous stuffed fowl that has made headlines around the country, but the Belfast Police Department can do them one better. Their white duck, the one quacking and shaking its tail feathers Monday afternoon in the dog kennel at the back of the police station, is alive. The duck was captured by Officer Lewis Dyer Monday afternoon after running — or rather waddling — amok in downtown Belfast, police said. The duck wandered through the city streets all the way into the Belfast Free Library, where Dyer was able to apprehend him, according to Officer Rick Smith. 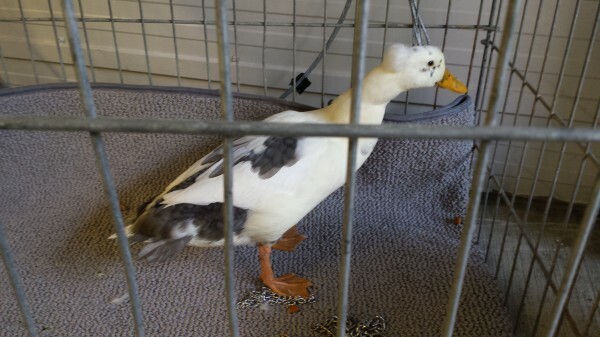 If the duck belongs to anyone, the owner is asked to call Waldo County police dispatchers at 338-2040.